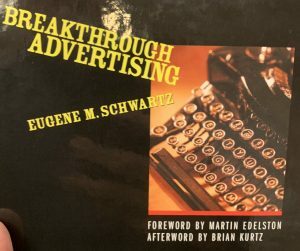 Summary of Breakthrough Advertising by Eugene M. Schwartz - Learn to speed read in 2 day course with the top Speed Reading experts in the UK. Speed Reading courses in London, UK. Speed Reading strategies to increase reading speed, comprehension and memory. In-house speed reading courses in the UK. Firstly, spot the existing trends and desires for your product and position it accordingly. Initially, keep it simple, in order to articulate and focus the target needs and desires in terms of a single image or word. Once you have identified the core need or desire, position your product or service toward it as an inevitable and only solution. Apply ‘only-ness’ brand positioning principle. What is the market desire or need that creates this market? What is the state of awareness about this product? How much do people know about the way your product meets this desire or need? Determine the state of sophistication. How many other products have been introduced to them before yours? The purpose behind a killer headline is to create curiosity about your product so the prospective buyers want you to “Tell me more!”. Include a detailed explanation of the product or service promise and how it will work for the buyer. The key message of the book is how to listen and read people and respond to their desires and needs. No point bombarding people with messages they don’t want to hear. Align and resonate with what the public wants, so you can write the copy that speaks to them. Once you have fully understood what it is that your potential audience wants, you can compose a message that doesn’t meet resistance and rejection. Once you understand what the public wants, you can then speak to them on a personal level as individuals. Schwartz refers to this as the “one-to-one connection.” Your ability to read and understand how your audience responds on an emotional level is the foundation of the process of winning the attention of your target audience and then selling to them. Capture reader’s attention with a headline that appeals to their most basic instincts and needs or desires to activate the primal impulses they already have and usually can’t control. 3) show your audience, in an authoritative, superior and expert-like way, how your product/service will meet their desires and needs. That, in essence, is the message of this book. The rest of the book is specific steps and practical ideas on how to implement the whole process of marketing, especially copywriting and advertising. The book is packed with good examples of effective copywriting, brand positioning and selling strategies. What Is This Mass Desire—and How Is It Created? 3 THE SOPHISTICATION OF YOUR MARKET: HOW MANY PRODUCTS HAVE BEEN THERE BEFORE YOU? Posted in #1 Blog On Speed Reading & PhotoReading, Summaries of Books, Good Books to Speed-Read, News, Research On Speed Reading, summaries of books.